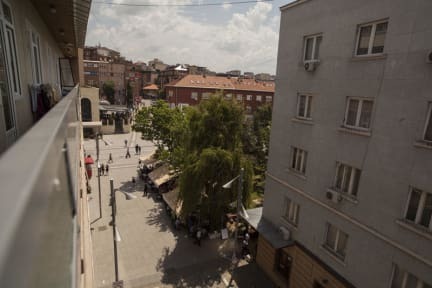 I loved my stay in Priština, specially the hostel. It was amazing going out with the local staff. Everyone was taking care of you at the first moment. Thanks guyes for making my time in Kosovo so special and just perfect. I have to come back some day. Staff was very friendly and helpful. I had a private room and enjoyed the atmosphere in the common room. The Hostel is almost directly located in the pedestrian zone, everything within walking distance. I can really recommend this hostel, I would stay there again. One of the best hostels we ever have been! And defintly the best Hostel in Pritina! The 3 guys that run the Hostel are super friendly and motivated. Everything was nice and clean and you're located right in the city center. Every bed comes with a simple basic breakfast. We spend 6 nights and we're looking forward to come againe next year. Stayed there for the second time. Helpful staff. Dormbeds with curtains - very good! One of the few hostels with enough toilets. Wifi very fast. Friendly stuff, central location and overall chill vibe made a very comfortable stay! thx again for the staff!